Sorcha is the seventh child and only daughter of a seventh son who is constantly at tensions with his neighbors over land. Sorcha spends most of her days playing and being loved by her six older brothers, but when an evil sorceress bewitches her father and puts her brothers under a terrible spell, only Sorcha can break it—though it might be the death of her. I was one of those kids (I’m sure you’ve known a few of us) who read our Complete Grimm Brothers’ Fairy Tales cover to cover until the book was in tatters. Among the hundreds of extraordinary—and, admittedly, some not-so-extraordinary—tales, however, the one about the girl who must endure great travails to free her six older brothers who have been turned into swans has always been one of my favorites, because it’s just so emotional, and the girl is so admirable. Happily, Juliet Marillier keeps my favorite aspects of the original fairy tale, and dresses it up in an astounding world of Irish historical culture and intricate political relationships. Unlike other retellings that may push aside the original for the sake of setting, DAUGHTER OF THE FOREST stays true to the tale at its core. Sorcha endures almost unimaginable sufferings in her quest to free her brothers, gets unwillingly pulled into social politics, and is wrongly accused of things that were not her intention. She is a strong protagonist not because she’s very active, but simply because she endures. The first 150 pages or so feel a little slow, but once the book moves into the frameworks of the original tale, I couldn’t put it down. This is a book I would’ve loved to death back when I first started reading fantasy in middle school, alongside lifetime favorites like Robin McKinley and other admirable fantasies by authors like Garth Nix. 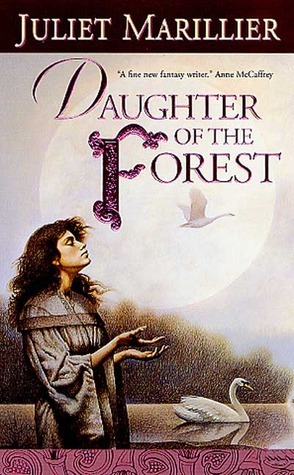 As it is, DAUGHTER OF THE FOREST is still an incredible book, full of the richness of my favorite kind of high fantasy. I’m glad I chose this one as my first Marillier book, and look forward to reading her other books in the future. I have this on my shelf, and I'm DYING to get to it! Really can't wait to read it! I LOVE Juliet Marillier's books. She is one of my go-to authors when I despair of finding something I like to read. I return to her books again and again. Seeing this review pop up made my day today. I'm so glad you enjoyed it, Steph. The following book is just as good. I have really high hopes for this one. One of my blogger friends keeps pushing me to read this one and it sounds phenomenal! I love this book so much! HEART'S BLOOD is still my favorite by Marillier (perhaps because I read it first), but yes, I LOVE this book!! This is one of my favorite books of all time. So glad you enjoyed it. I love this book very much!I really enjoyed it. This has been on my to-read list for years. Isn't it part of a series too? Please tell me it ends well, because even though this is one of my favorite fairy tales, she goes through a lot.